Photos by William Mohan Local manufacturers took part in Chautauqua Lake Central School’s Manufacturing Career and Transition Festival this week. Among businesses present at the school were Cummins Engine, Fancher Chair, Weber Knapp and Rand Machine. 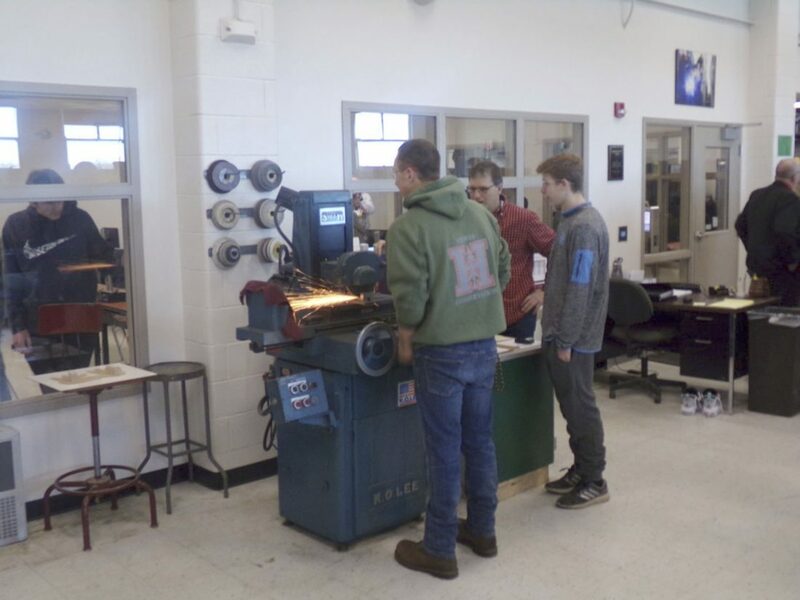 MAYVILLE — Local manufacturers introduced students at Chautauqua Lake Central School to potential careers in the field this week. The manufacturers participated in the school district’s Manufacturing Career and Transition Festival. Topics covered included electronics, manufacturing and welding. Among those in attendance were manufacturing employers who constantly look for new manufacturing professionals to join the workforce. Some of the regional manufacturers present Monday were Cummins Engine, Fancher Chair, Weber Knapp Co. and Rand Machine. The event lasted two hours and included a tour of the Science, Engineering and Mathematics manufacturing lab that opened last year. Superintendent Benjamin Spitzer opened the program with an introduction to the history of the program. “We started off three to four years ago with just an idea to start a manufacturing club and we didn’t have a space other than a small woodshop area,” Spitzer said. Today, the shop in its current layout has room for welding, computer numerical controlled milling, surface grinding and other manufacturing/shop applications. “We think it’s akin to a shop form,” Spitzer said. “We’ve got a lot of equipment in this facility including a couple of Haas machines. The machines in particular are a CNC miller and a CNC lathe. There are also metal inert gas, tungsten inert gas and stick welders. “From that idea we developed a program that offers two different pathways for kids to get a STEM education,” Spitzer added. The first is Project Lead the Way, whereby students would attend engineering classes at the Rochester Institute of Technology. The second is transition to Jamestown Community College upon graduation. Both pathways are in cooperation with Project Lead the Way’s sister program: Gateway to Technology and the Chautauqua Lake Manufacturing Club. The school also has a certified production technician capstone class. Both pathway programs include 10 courses totaling 30 college credits. Project Lead the Way includes JCC transition courses and credits to RIT including engineering drawing with automatic computer aided design and introduction to engineering and design at JCC. Students then transition to classes in digital electronics, engineering principles and civil engineering and architecture at RIT. The second pathway includes drawing and design production and manufacturing classes at CLCS. Those classes then transition into shielded, gas welding and safety at JCC. Either pathway leads to Machine theory at JCC in the first semester and computer integrated manufacturing at RIT. A manufacturing lab tour then took place. During this time, the manufacturers were show the students at work on their various manufacturing projects.